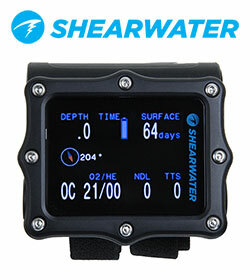 Sleek and sophisticated, the Shearwater Perdix is a low profile, technical dive computer with a contoured design. The high resolution 2.2 inch enhanced colour display is easy to read in any condition. The Perdix is powered by a single AA battery, giving up to 45 hrs dive time, protected by a double o ring seal, the battery can be easily changed within a minute. Four dive modes, gauge, OC rec, OC tec and CC INT, the user interface is also fully customisable and has 7 language options.